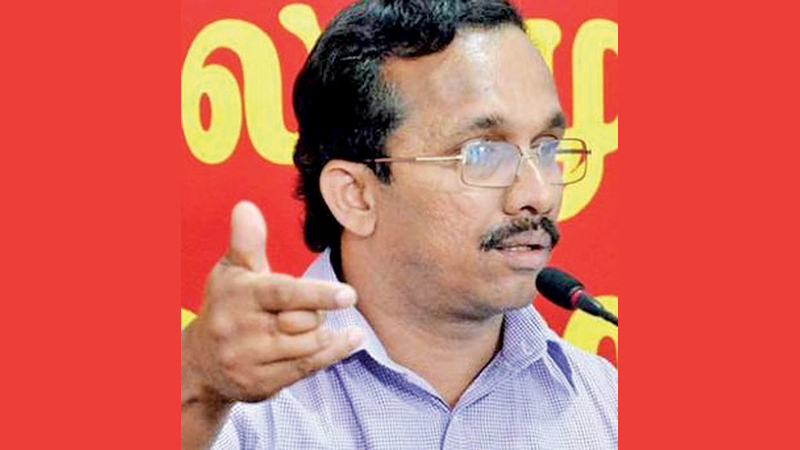 JVP MP Sunil Handunnetti told Parliament yesterday that the government is whining that there is no revenue while they themselves have failed in streamlining the public sector revenue collecting mechanism. “To the best of my knowledge, the trade unions of the department went before courts and obtained an order that a senior qualified officer of the same department should be appointed to that post. Since then the government keeps delaying the appointing of an officer to fill the vacancy. Does it mean that you are planning to appoint one of your cronies to that post? There are many vacancies in the Government Valuation Department. There are only 365 Valuers serving in the department which has around 500 vacancies for more valuers. Since 2012 no recruitments have been made.The Jayewardhanapura University has produced around 400 graduates who completed the valuation course and they are now among the unemployed graduates.But the department had not recruited them You cannot fill the existing vacancies with others but only with those who have qualified in that subject.The question is why the government does not fill those vacancies,” he questioned. He said that since these institutions are not streamlined, they have been rendered inactive.“The government’s intention is to let them collapse and face a natural death so that it could privatize those services. These institutions have been in existence for more than 100 years. Ín response, Minister Eran Wickremaratne said that the government would fill the vacancy of the Inland Revenue Commissioner General’s post very soon and had no intention of appointing a foreigner.